The Peanut Butter and Jelly Cookie Cups I posted earlier in the week were good, really good! 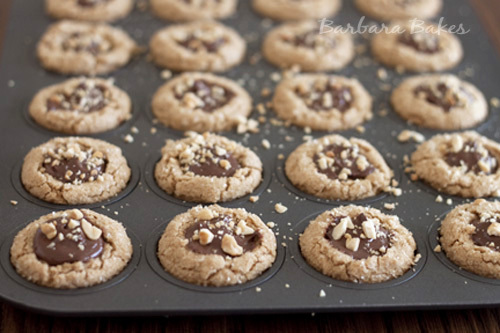 But these Peanut Butter and Nutella Cookie Cups are even better. 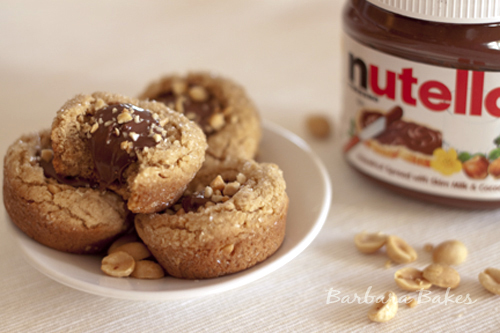 When eating a Peanut Butter and Jelly Cookie Cup you’ll say mmmmmm, but when you eat a Peanut Butter and Nutella Cookie Cup you’ll say, oh my! I used our favorite peanut butter cookie recipe, which is a little more fudgy than the PB&J Cookie Cups recipe because it’s made with butter and has twice as much peanut butter. I roll it in turbinado sugar so there is a little bit of crunch on the outside, which is a wonderful contrast to the fudgy cookie and smooth creamy Nutella middle. Oh My! Preheat oven to 350 degrees. In a small bowl, sift together the dry ingredients and set aside. Cream the butter and sugar in the bowl of an electric mixer using the paddle attachment. Add the egg and vanilla and beat until combined. Add the peanut butter and continue beating on low speed. Add the sifted dry ingredients and beat until just blended. Form dough into 1 1/2 inch balls. Roll balls in turbinado sugar. Place each ball in a cup of a greased mini muffin tin. Bake 10 to 12 minutes until edges are browned and crackled, the centers will not be completely set. 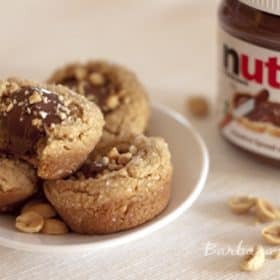 Remove the cookies from the oven and using the end of a thick-handled wooden spoon make a small, deep well in the center of each cookie and fill with Nutella. Sprinkle chopped peanuts on top of Nutella. Transfer cookies to a rack to cool completely. I’m confused. You roll the dough into a ball and put in mini muffin cup. Do you spread it out or leave it in a ball? Hi Ellen – no need to spread it out, it will spread as it cooks. Enjoy! OMG! We have made these cookies 6 times and they are a favorite with our family and friends. This is the first time I have ever bought Nutella, (just for these cookies) and now we are on our third jar! Caution: highly additive cookies! Amazing. Something about baking them in the miniature muffin tins. 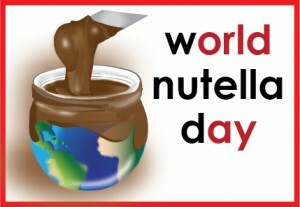 Oh, and the Nutella filling. And the PB. Thanks for posting and for beautiful pics! Thanks! So glad you liked them. It’s one of our favorites. Thanks for taking the time to let me know you made them. Thanks so much for visiting again Barbara! You’ve honestly inspired me to make all sorts of cookies and put Nutella in them. Actually for the brownie recipe I was originally going to make a Raspberry Icing for the filling, but it didn’t work at all so I went back to good ol’ Nutella – they were delicious!